The United Kingdom is in the middle of a widespread O2 network outage, affecting millions of customers. Early on Thursday morning, the O2 network experienced some issues. Unfortunately, things snowballed from there, and now millions of O2 customers throughout the U.K. have little-to-no mobile data at all, via the BBC. 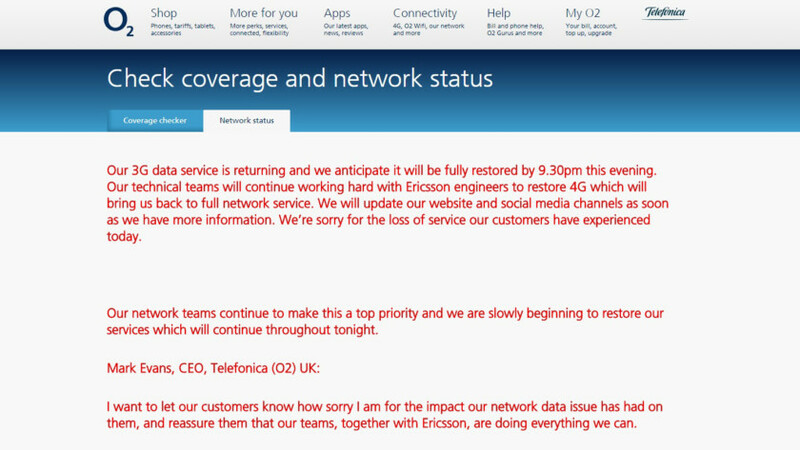 O2 chief executive Mark Evans issued a joint apology with O2 network equipment supplier Ericsson over the outage. The two firms promise to have 3G data up and running by 9:30 PM GMT and 4G data restored by sometime on Friday morning. After EE, O2 is the second-largest mobile network operator in the United Kingdom with over 25 million subscribers. The O2 network also powers services for the Sky, Tesco, Giffgaff, and Lycamobile networks, which have an additional seven million users total. O2 says that voice services should not be affected by the outage. However, some customers are reporting voice issues as well. Back in October, O2 had another network outage that was a trifle, by comparison, only lasting about 40 minutes.